← What are the Best Jobs for Single Moms? The military features a wide range of branches. If you have just started your research on military careers, the options can simply overwhelm you. A good idea would be to visit military career fairs. 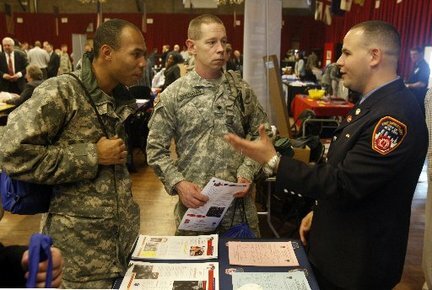 These fairs give a good knowledge about the kind of jobs that the military offers. At a military career fair, you can educate yourself on the different branches of the armed forces and the training procedures. Since a military job fair is no less different from other career fairs, you need to prepare yourself appropriately to reap the maximum benefits. Given below are some key tips that you can use while visiting a military career fair in your town and get the maximum out of it. Find out about the upcoming military fairs in your area. Check out the local newspapers, college career guidance center and recruiters for detailed information on such career fairs. If you interested in military careers, you should do some homework on your own. Find out about the different branches in the military. The point is to prepare yourself to ask relevant questions at the career fair. If you don’t know anything about military departments, you will not be able to get maximum benefits. Plan in advance as to how you will spend your time at the military fair. What booths you will target to fulfill your requirements. Plan what people you would get in touch with to get answers to your queries. Military fairs are not different from other type of job fairs. Therefore, you need to look at your professional best, so as to attract significant personnel’s attention at the career fair. Be ready with a brief introduction of yourself. Introducing yourself appropriately is key to achieving the maximum benefits at any fair. While at the military fair, you will talk to service personnel. Most of the candidates make the mistake of not following up with recruiters or service personnel at the fair. Do remember to send a thank-you note or mail any kind of documents that they asked you to send. If you prepare yourself in advance, you can certainly make the most of your military fairs and benefit your professional career in many ways. Follow the above mentioned tips if you are planning to visit a military career fair soon.